The 5th-generation dedicated server series "Filer" offers great storage capacity and reliability at a great value for money. 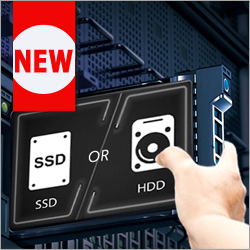 Based on high quality single - socket motherboards of the manufacturer Supermicro, all servers with up to 80TB hard disk space or 8TB fast SSD storage and Gigabit connection are provided. The "Filer" server series was developed for private and professional users with high storage requirements and reliability. All installed hard drives are 24x7 certified and allow a software - based RAID raid to avoid data loss (hardware raid with "Filer 80T"). Overview dedicated Server Series "Filer v5"
The Filer v5 Series servers offer many storage applications, from creating a paged storage or backup system to running your own multi-server storage network. Flexible growth of your own demands on the infrastructure is a great advantage for concentrating on your own project or the administration of the server without investing in your own hardware.